When you live in Manhattan, the prospect of a permanent weekend or summer home—a quick, peaceful escape from the city—is a dream you’re always chasing. I’ve timeshared and rented my fair share of houses in various hops from the city. But after a few recent visits to a friend’s new house in the North Fork, I’m falling—well, tumbling, actually—towards that dream. The North Fork is the northeast point of Long Island, the Sound side of the island, opposite from the Hamptons. Which means you get all the peace, quiet, and surrounding water that the Hamptons offers, but with less of the snob factor and crowds. Could I really be a Long Island girl? I’m thinking so. The first reason is because the North Fork is wine heaven. You can’t drive two minutes down any road without being greeted by another beautiful winery surrounded by vineyards as far as the eye can see. The second reason is because it has the freshest food I’ve ever encountered. Every corner has a farm stand, where you can gather all your eggs and fresh vegetables for the weekend (usually on the honor system). Plus, the seafood is straight from the nearby water. Lobster for days! The final reason is because it’s super easy to get to for a weekend escape. Especially since I discovered Maven, my new favorite car rental app. Owned by GM, Maven feels like the beginning days of Uber: the cars are all higher class; and there’s no annual membership fee. Go to a nearby parking garage to get car. Unlock chosen car with phone. No physical card is needed like Zipcar. No traffic-filled commute to a local airport to wait in a DMV-like line to pick up a boring economy car. No waiting. It is the most civilized rental experience I’ve ever had. After an experience like that, a weekend getaway to the North Fork is a breeze. Tolls and gas are covered by the rental cost, so even those elements are seamless. 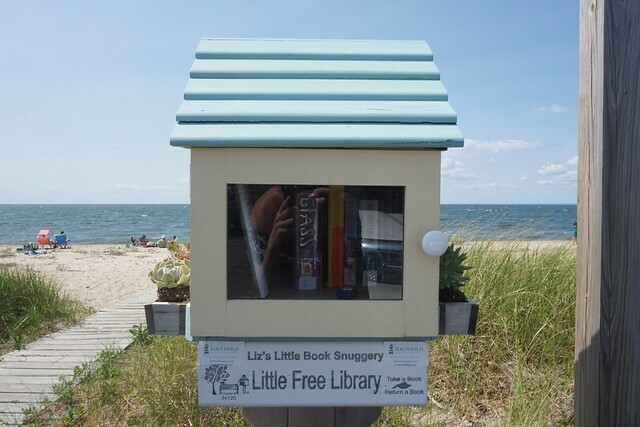 Maven allowed us to enjoy the best of what the North Fork has to offer, which we’ve outlined here for you. Orient Beach State Park is our favorite of the bunch. The sound side of the island is more rocky than the Hamptons sandy shores. But Orient Beach offers plenty of wild sand in the state park. There are grills for picnics, plenty of options for water sports, even an adorable swing for two. Plus, the wildlife is stunning—you’ll share the beach with great blue herons, egrets, and osprey. Entry is a small fee, but it goes to the park conservation. Get more details here. Every girl has dreams of running through purple lavender fields. You can actually make it happen at Lavender by the Bay in East Marion. 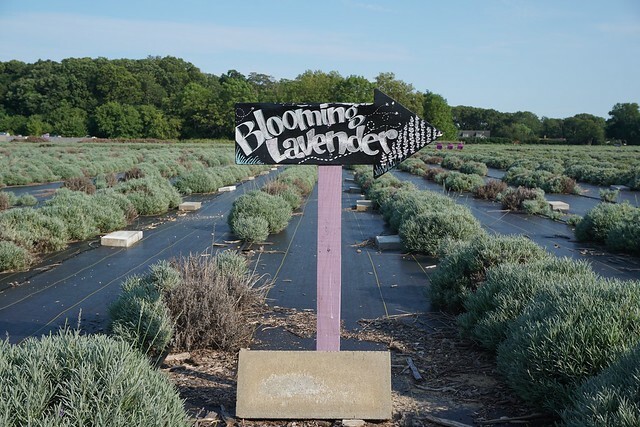 One of the country’s largest lavender farms, this family-run establishment sees its peak blooms twice a year (check the website for approximate dates) but the nearby market serves up lavender goods year-round. 7540 Main Road, East Marion, NY 11939. Get more information here. In summer, the vineyards are calling, but in the fall, the apple trees and pumpkin patches are the place to be. There are plenty of farms to pick apples and pumpkins in the North Fork. 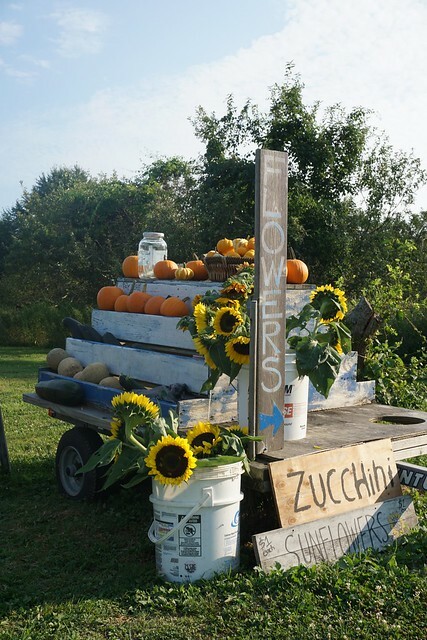 Our favorite is Harbes Family Farm in Mattatock, which has two large pumpkin patches, two mazes, and even a hayride. And Harbes orchard in nearby Riverhead. You could visit both in one day. Get more details here. 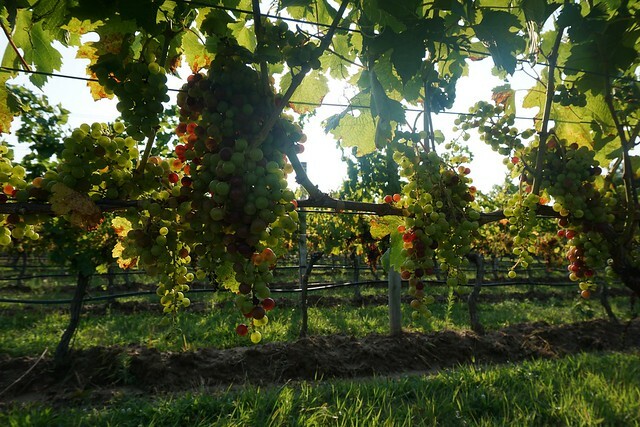 Let’s be real, wineries are the real draw on this stretch of Long Island. And while some of the larger wineries have been in the North Fork for many years, new boutique wineries are cropping up and challenging the old guard to offer better tastings and member perks. You could be overwhelmed by the sheer number of vineyards in the area. But, never fear. We did the heavy lifting and spent a few weekends assessing which are the best tasting, the best places to picnic, and the friendliest staff. 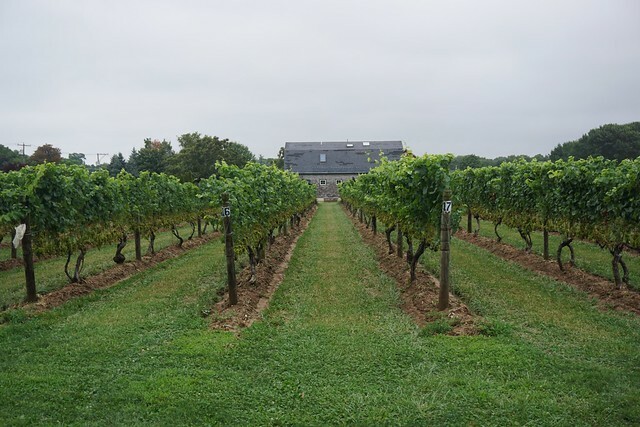 Originally the only vineyard in the states to exclusively produce rosé, this winery is known for the pink stuff, and has the varietals to show for it. The old farmhouse looks small when you drive up, but the backyard offers a huge tasting barn and garden, a perfect setting for a sunny day. 1450 South Harbor Road, Southold, New York 11971. Get more information here. Lieb is our second favorite vineyard to visit. It’s not in a cluster of wineries, so the view from the tasting patio is a breath of fresh air. The staff is super friendly, the wine is small-production, and the food is delicious—definitely go for the cheese and smoked trout, it’s perfect with their wines. Plus, Lieb constantly hosts live music in its glorious tent. If we lived here, we’d be members. 13050 Oregon Road, Cutchogue, NY 11935. Get more information here. 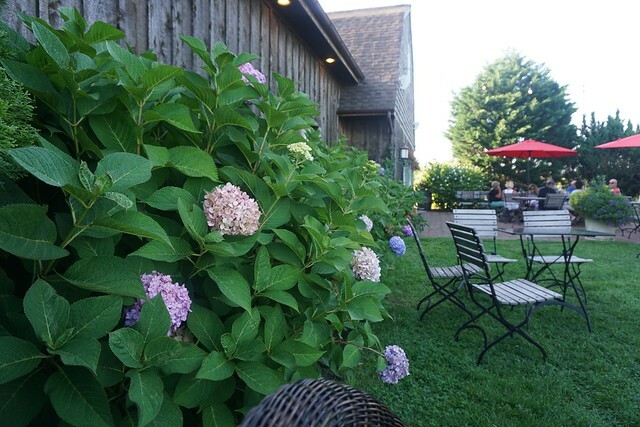 Macari has two tasting rooms, but make sure you head to the one in Mattituck. This beautiful tasting room overlooks the vineyards. 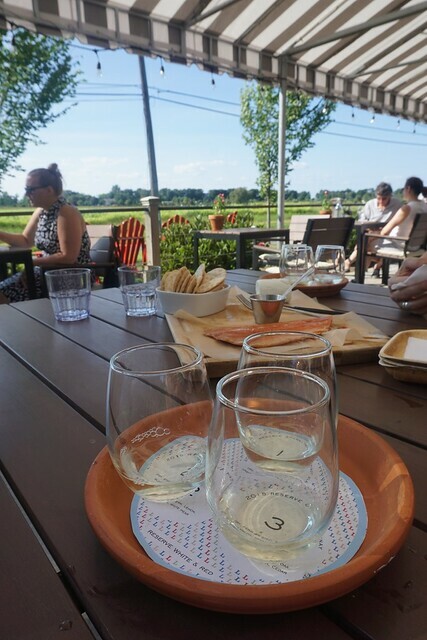 The flights of wine are some of the best in the North Fork, and the family-run company offers up imported artisanal cheese and charcuterie to make your picnic perfect. On the weekends, there’s even a neapolitan pizza truck, which is perfect for lunch. 150 Bergen Avenue, Mattituck, New York 11952. Get more information here. 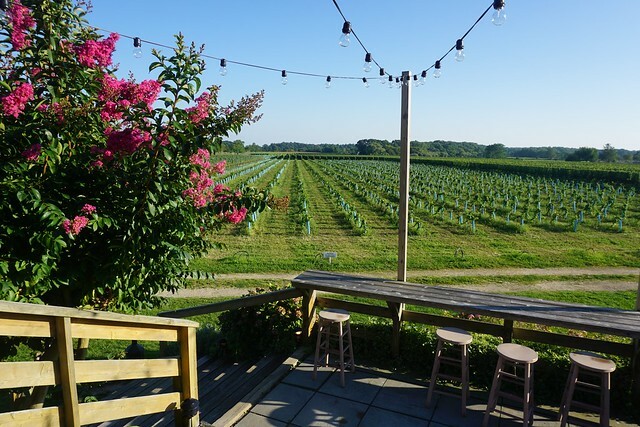 The vineyards are beautiful at Roanoke, but that tasting room requires a membership (well worth it if you’re in the North Fork often). Otherwise, head to the tiny tasting room on Love Lane. It’s a small shop, and there aren’t any vines to look at, but the people pouring are always the friendliest. Plus, you can bring in any food from any Love Lane shop and enjoy their back patio and the rest of Love Lane. 165 Love Lane, Mattituck, New York 11952. Get more information here. Let’s be real: if you’re staying on the North Fork, you should be buying fresh food and grilling at home. The restaurants (with one exception, see below) can barely hold a candle to the farms that litter the peninsula. 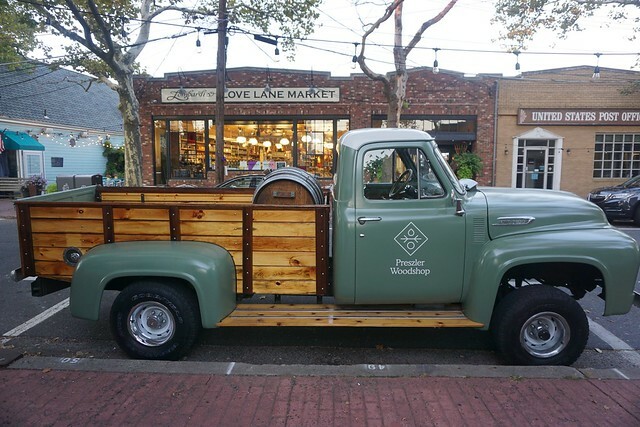 For all of your dry goods, oils, and other barbecue necessities that you can’t get from the many farm stands, head to Lombardi’s on Love Lane. This adorable market has the best of the best from local purveyors and around the world. 170 Love Lane, Mattituck, New York 11952. Get more information here. The Village Cheese Shop is one of those shops that is an experience to visit. It’s like a museum—you just want to ask questions, taste different cheeses, and keep asking more questions. The staff are experts on every type of cheese from around the world. You won’t get out of there without spending a pretty penny, but it’s worth it, especially if you’re supporting the local farmers (and perhaps buying some imported cheeses, too). Anything to pair with all that wine. 105 Love Lane, Mattituck, New York 11952. Get more information here. 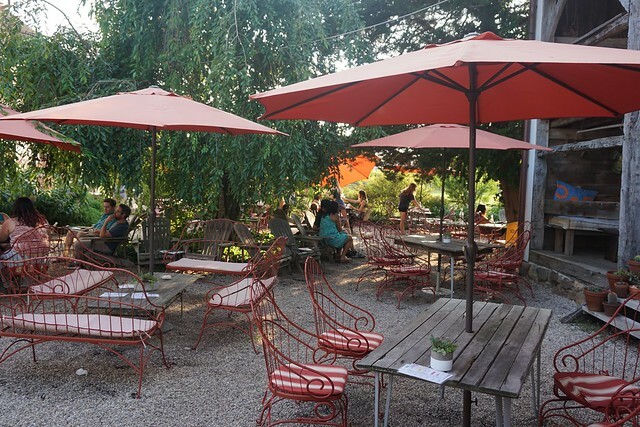 If you really don’t want to cook, we would recommend only one restaurant, American Beech in Greenport. This stunning indoor-outdoor space has fresh coastal American fare with unique appetizers, hearty entrees, and delicious cocktails, making everyone in your party happy. The staff (mostly Long Island kids on their summer break) is super friendly. And after dinner, you can retire to the bar outside, which is built around an enormous tree. 300 Main Street, Greenport, New York 11944. Get more details here. BitchBiz: This article was written independently. Maven did supply a car for the weekend. Thanks, Maven!